What Social Cues Should You Be Aware of? Before you begin working your way to foreign language fluency, it helps to understand the culture behind the language you’re learning. After all, language exists to help a group of people express their ideas and beliefs. France is an old country with a rich history and culture. As you begin your French language program, gaining a strong grasp on this history, the values, and the etiquette will help you rapidly achieve success. In particular, French have different social norms than what people may be used to, so it helps to know what to expect to prevent any taboos. It is well known that the French use their hands while communicating, and it’s more common to see this behavior in the southern regions of the country. Personal space is not as important to the French as it is to Anglo-Saxons and Americans. They are comfortable with a distance of one foot, while British people normally stand about two feet apart. In general, when you see French people conversing, they will stand in closer proximity than British or American people. The French are more serious in their expressions and won’t smile much unless something really tickles their funny bone. They view the American and some British peoples’ constant good humor and cheerfulness as disingenuous and untrustworthy for the most part. Being reserved and composed with a serious manner is more appreciated by the French people. Good posture is well regarded in France, as slouching and otherwise looking too relaxed is indicative of a bad upbringing. 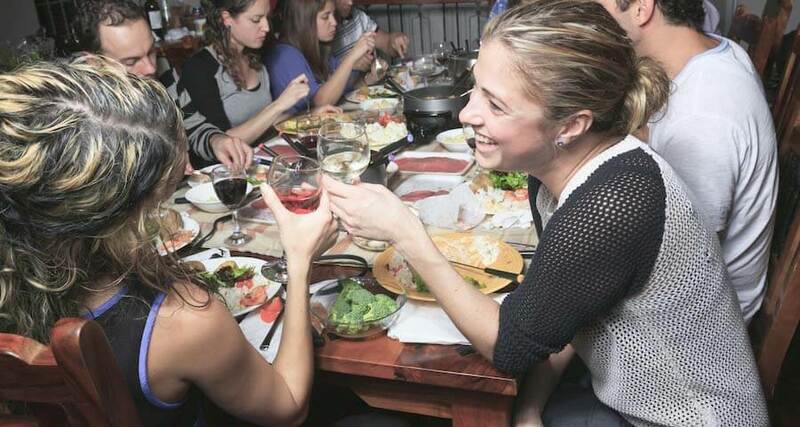 While dining, be sure to keep your feet and elbows off the table. These customs have become a bit more relaxed in recent times, as you will see many French people with their elbows on the table during a meal. Raising your voice in a public setting is not acceptable; children are taught this is a sign of being raised poorly. You should speak clearly, but never raise your voice, and always maintain control of your body and emotions. Some French body language is similar to that of many countries, others are the exact opposite. Some gestures and behaviors may seem like common sense but will take on a whole new meaning in another country. You would think being polite and having manners is universal in certain situations, but closer examination into French manners proves this is not always the case. Yawning is an excellent example. Yawning for most people indicates sleepiness or boredom, and most people will use their hand to cover their mouth. The same applies in France, but it also applies to using a toothpick. The French always cover their mouths when using a toothpick, and you should also turn your head away from those around you when using a toothpick. This also applies if you sneeze or blow your nose – make sure to turn your head away from people around you. The French are known to become bored easily and will signal their boredom, irritation, or annoyance in ways that may seem rude or disrespectful. Wiping a hand across the forehead, flicking fingers across a cheek, staring straight ahead, or playing an imaginary flute, are among these signals. Another gesture that can come across as rude and immature is shrugging of the shoulders, typical “whatever” behavior for American teenagers. It’s also typical in France, but not only with teenagers, and it pretty much conveys the same thing when an adult does it. The following are gestures that are similar to those used by many people in other countries but are done a bit differently or for the opposite reason in France. Counting is one. The French start counting with their thumb, not the index finger. The thumbs up gesture used in America means worthless in France. Calling someone is done with the palm of the hand down, all fingers toward you. For a waiter, use eye contact and a little wave. Pointing is not done in France. They use an open hand instead, for things such as indicating and hitchhiking. Some other common gestures include kissing your fingertips for good food, and pulling a cheek down with a finger below the eye, which means “I don’t believe you.” Touching the side of the head with an index finger means you think someone’s crazy; this is also common in Great Britain. In the United States and in Britain, strangers greet each other as they pass one another on the street. A smile is usual, but passersby usually get a nod at the very least. This is quite different from the way it is in France, and visitors new to the country may be put off by the lack of social engagement among strangers. Most French people see no point to such trivial greetings, so they won’t engage in them. Polly Platt, author of French or Foe?, says people shouldn’t be bothered by this lack of interaction. She says the French find no reason to smile, where there’s no shared moment. However, in observing something amusing together or another mutual moment, the French are just as likely to nod and smile to a stranger as any American. While it’s rare, the French people do display a sense of pleasantry and good humor. Most of the time, French people are more somber than British folks or Americans. Under most circumstances, the French people are reserved and may seem distant, but no offense is intended. That’s simply the way they are, says Platt in her book. However, where there’s a reason for humor or levity, they will smile copiously. French presidents, such as François Mitterrand or Jacques Chirac, have often shared a story that a photo of a past French president has long perplexed the people of France. It seems they did not recognize their leader, simply because he was smiling in the photograph.